I LOVE making lists....I sometimes don't take the time to do it, but aren't they great? I mean, there is nothing more gratifying than checking things off of a list. At my new job, we have created this great little web app that allows you to manage all of your lists in one place. I've been using it at work, and it's been quite useful. I have been thinking about lists a lot lately, especially since it's my job to promote this app :) So, I though it'd be fun to share some of my favorite reasons to make lists. #1 It helps me manage my time. For some reason, if I don't make a list, I never get as many things done. #4 It's proven that you'll remember things better if you write them down. 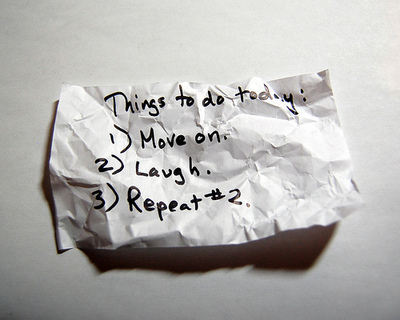 So, if you're like me and forget to look at your list, chances are you'll still remember what you were supposed to do. #5 Making a list is like taking out the trash. It gets rid of mental stress by emptying your mind of trivial things. #6 It's always important to schedule in breaks. If you don't write it down, you may not remember to take one....or maybe you'll be breaking all day wondering what you should be doing. #7 Making a list helps you focus on the important things. #8 There is something very gratifying about checking things off your list. It gives me a sense of accomplishment and pride. Try keeping a notepad and pen with you to write down you list on, or if you work primarily at a computer, TidyLists may be just the thing you need to get you going.